Just find a job you love. Simple, right? At Aptus, we believe simple beats complex almost every darn time. As we highlight in our Hierarchy of Financial Needs, your retirement outcome is more likely to be determined by your savings rate than it is to be driven by clever stock picking or crafty asset allocation decisions. 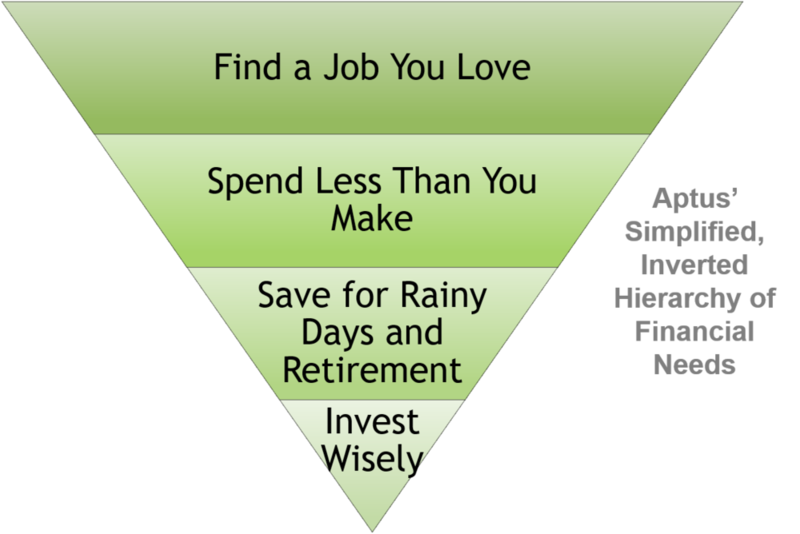 In fact, we believe you should turn that pyramid upside down to form our Simplified, Inverted Hierarchy of Financial Needs. Find a job you love [or at least don’t hate], spend less than you make, save for rainy days and retirement, and invest simply and wisely. When we present this concept to clients, we often caveat it by saying we can’t really help them find a job they love. There are limits to the scope of our work, right? Well, we’re not a staffing firm but we do have some thoughts on finding a job you love. Follow your interests and opportunities—not necessarily your passions. While there are a few rare birds out there that seem to know their calling at an earlier age, most of us spend our lives bouncing along a somewhat random path. That’s fine. We have long working lives and the days of single-employer careers are all but gone. Be humble and curious. Learn and absorb. Seek out successful people and pick their brains about their past, present and future. Keep your eyes and ears open. If your interest and opportunities happen to align with your passions, great. It’s also perfectly fine to learn, earn and save while pursuing your passions in your spare time. Location matters. One of the features of modern life is that we often live in a different place than we grew up. If we follow our opportunities, our path might lead us away from family and friends. Be careful with this decision. Strong, long-term connections with a community can be incredibly positive forces in our life. Family keeps us grounded. Laughing with life-long friends nourishes us. Having grandparents involved in raising our kids enriches the lives of all involved. We would prioritize opportunities that keep us close to family and friends, but we see important exceptions. You may have grown up in a small town, gone off to college and changed in ways that make it difficult to return. Go ahead and spread your wings. You may have grown up in an area where housing is simply unaffordable relative to your potential income. When we work with clients in the San Francisco Bay Area, we always ask them to at least consider moving to an area where mortgages don’t squeeze out all other spending. It’s ok to make sacrifices for money, but those sacrifices need to be finite. If making lots of money is your sole objective in a job, it won’t last long. Maybe a high-paying gig doesn’t need to last long, though. If you come out of college saddled with debt and can take a 2-year, high-paying job that will allow you to pay off the debt quickly, you should probably do it. The people make the job, not the work. Do you like your boss? Your peers? Your direct reports? Is the atmosphere collaborative, creative and supportive? Do the people make you laugh? If you are surrounded by smart, vibrant, funny people, you are almost certainly going to love your job. Before taking a job, talk to as many people as possible in as many situations—office, lunch, happy hour—as feasible. The more you save, the more options you’ll have. You should start to save up an emergency fund as soon as you can. When you are young and single, having a cash cushion will give you the confidence to change jobs. As you get older, an emergency fund might be give you the confidence to quit a bad job to pursue a dream job. We think this is the point of the FIRE movement. Work hard to achieve financial independence so you have the freedom to pursue your passions.